Yesterday the Alphaville Herald snuck in before Tateru to post a story that quickly fluttered across the SL related infostream. So for the rest of the day my twitter feed was dropping many re-tweets of blog and forum posts on how Linden Lab could reverse the falling concurrency. Some blame the New User Experience as the root of the problem, others blame a lack of incentive or tasks. Others go so far as to blame the entire Linden Lab structure. I don’t believe changing the first user experience is going to help and i don’t think adding incentives for people to do anything will help either, why? because the issue i believe is communication within Second Life Platform. Tateru points out a coincidence in the timing of a certain open spaces fiasco and the end of “sustained growth” in SL around March 2009. But i’d like to point out some other coincidences of around that time period. 1) People start reporting Group Chat failures . 2) Twitter takes off big time. 3) LL acquire Onrez & Xstreet and start promoting it to EVERYONE. Why i think these are important factors in the dwindling concurrency is to do with how we communicate the SL world. While all these other highspeed ways of communicating to each other are taking off, SL it self starts to fail or just not move with the times in it’s ability to communicate. Today i have not logged into SL yet to find out what my SL friends are up to, no need as they are telling me on twitter. I don’t need to venture in world to find out what events are happening or what drama there is, i can find out on Blogger or Tumblr. I don’t need to login to learn how to make Mesh content, i can just watch Youtube video tutorials or head over to the forums. I don’t need to log in to search for new clothes or specific objects to put in a new role-play experience, i can just head over to market place. The number ONE form of communicating with strangers in SL. I often find that people around the globe find it easier to text chat than voice. One of the oldest forms of peer to peer communication, and still going strong in SL. In the RW my usage of IM messengers such as iChat and MSN has dwindled due to Facebook and Twitter. It’s only the Old tech guys that seem to still use IM clients which is probably a reason why Linden Labs SLim client never left the beta band. But there is still a market for communicating to your SL friends inworld and as i just pointed out, for me at least Twitter is filling that roll. Issues started to appear probably before early 2009, two years ago. How important is group chat? i really should not have to explain that. Its frustrating to get any information out about current happening issues, events, help, etc. Group chat maybe the only bit of inworld communication that can not be experienced outside of SL, yet it has not worked properly for over two years! To me the whole premiss of ‘group notifications’ has long become old tech and predates some of the more proven and successful ways of sending short informative notices. Most people call it ‘Microbloggin’ now, and send the same notifications on Twitter or Plurk as a more efficient way to contact people across their many interests in SL, not just one group. Notices used to be the best way to send out events, news, landmarks etc, but since SLviewer2’s skin job notices i find often get lost. If you are lucky you will see a notice pop up then disappear quickly, then when you check the little tiny corner box you discover in no particular order 99 notices you didn’t know you had. Then you enter a clicky mess to read through them all. Many people use notecards to send information with pics and landmarks embedded in them. Thats because of fear that an Instant Message will be ‘capped after 25’ and you will never receive said IM. It’s just another example of how communication in SL is fragmented. I hate receiving notecards, because i have to login to find out wether it’s important or not. I prefer to be IM’d because my iphone receives all offline messages and my iPhone is with me almost ALL the time so i can reply if i need to without having to login these days. I never really use voice so cant really comment on this feature. I don’t use it, my friends don’t use it. Only people i’ve seen use it are Newbs at welcome area and Linden Lab staff at meetings. Yes search is an important form of communicating, probably one of the most important. Yet this thing has been neglected also. I pay money for my shop to be listed in search but im almost certain no one has ever found it. I don’t even use inworld search anymore because the results are confusing, the interface clunky and detached from everything else. Before i log into SL to go on a Goony Adventure i search the SL website destination guide, or twitter for anything new and interesting. The events guide is a way to communicate your events to people outside of your immediate circle. This thing has not changed since i first joined over 5 years ago. It should be a really helpful feature but it’s kinda stuck in the back next to search and i always forget about it. I often get group chat messages from like minded people looking for an event to go to, (but im never able to reply due to group chat not working properly). The reason for this is simply because they want events that are more targeted to them and their interests. The SL community is a world wide collection of people with many different interests, and given the right tools they will share and promote each others interests freely and creatively. The decline in concurrency to my eyes is the result in SL’s stagnation and neglect in what the rest of the tech world saw as a changing evolving era of communication. 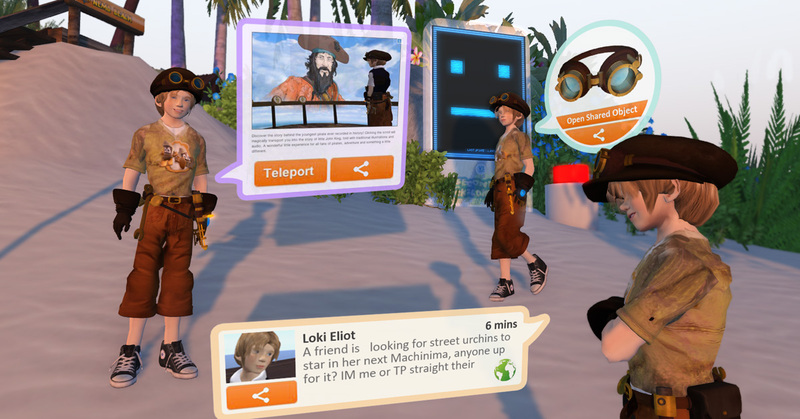 When Linden Lab bought Avatar United i was excited, i thought maybe finally we would get a reworked base for communicating in SL featuring microblogging, more functional groups ect. Now either that whole thing has gone dead like Slim did or perhaps it’s simply in the works and they are keeping it secret. CEO Rodvik did allude to “long-term initiatives that I think will be truly jaw-dropping” . I can only hope one of these initiatives is a new communication structure that allows SL residents to not only share and communicate between each other Inworld, but also be intergrated with the popular forms of communication outside. I’d like to see the many interests and creativity in Second Life being streamed directly from Inworld out to the rest of the web. There is no simple fix to this, they cant just slap a like button to everything, they have to work harder than we’ve ever perceived them to work before. Linden Lab can ad shiny Mesh, slap on a new Ui skin, make the platform less laggy and introduce a basic viewer, all that will improve sign ups. But if Linden Lab does not address the ways its users communicate to each other what they build, visit, role-play and love about SL then concurrency will continue to drop as more and more users spend less time inworld communicating and Sharing.